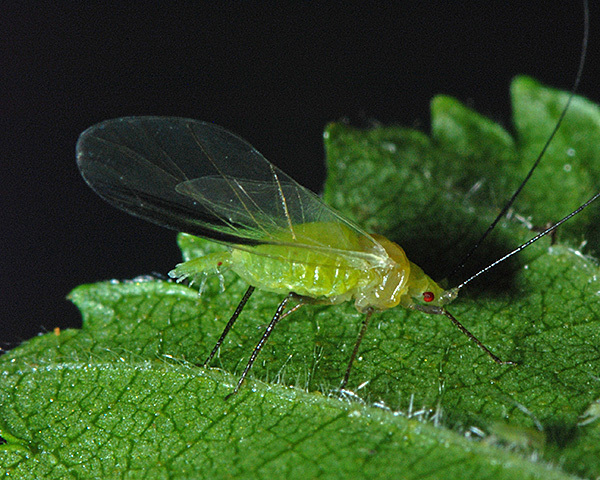 Adult winged forms of Monaphis antennata are green, with very long thick antennae that are black except at the base. The terminal process of the antennae is nine times as long as the base of the last antennal segment. Their siphunculi are very short with a flange. The cauda is tongue-shaped and not constricted. The forewing of the alate has an elongate dark pterostigma (see first picture above). The body length of an adult Monaphis antennata is 3.3-4.3 mm. Monaphis antennata live solitarily on birch (Betula species). They migrate to the undersides of the leaves for the final moult. Sexual forms occur in September-October. They are found in Europe, eastward across Asia to Siberia, China and Japan. We have found this reputedly rare species on birch at two locations in Britain, Burton Pond Nature Reserve in West Sussex and Selwyn's Wood Nature Reserve in East Sussex. 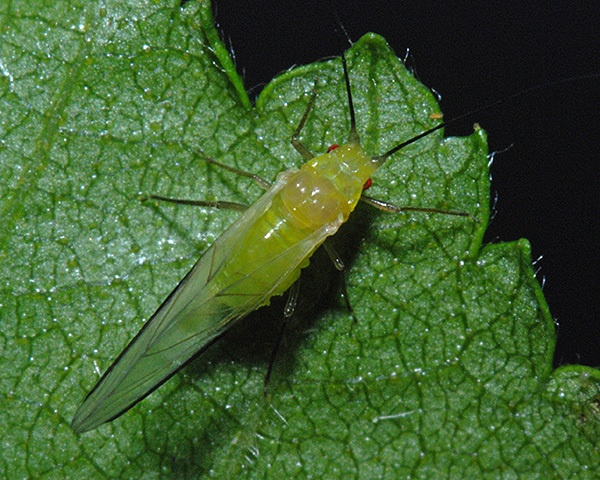 At Burton Pond female viviparae were depositing nymphs on the birch leaves as shown below. The long curved antennae of the nymphs are especially distinctive, and enable one to identify even very young nymphs as being of this species. 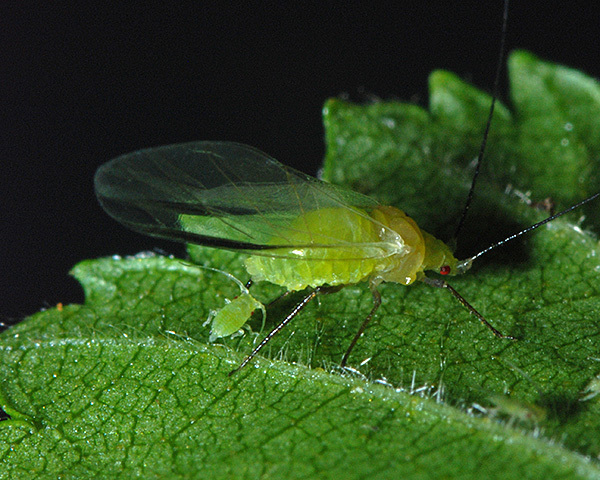 In the pictures above the female is (unusually) depositing her nymph on the undersurface of the leaf, perhaps because that surface was oriented upwards to enable illumination for photography. Monaphis antennata nymphs are normally found on the upper sides of the leaves and Hopkins & Dixon (2000) showed experimentally that fourth instar nymphs will settle on the upper side of the leaves if leaves are orientated naturally. 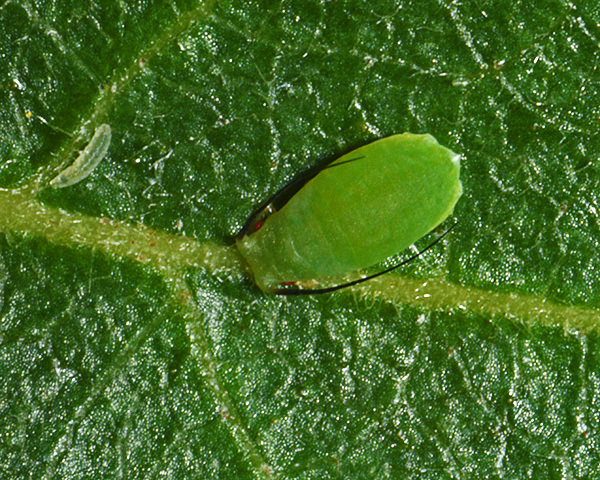 Interestingly, if leaves are orientated with the undersurface upwards around half the aphids still prefer the former upper surface, suggesting that the aphid is responding to a leaf feature rather than just light or gravity. 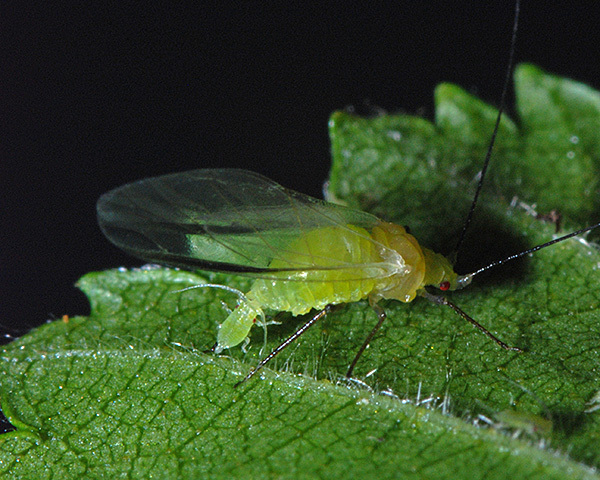 Hopkins & Dixon (1997) thought that the upper surface of birch leaves (where most birch aphids live) provided an enemy-free space compared to the under surface. 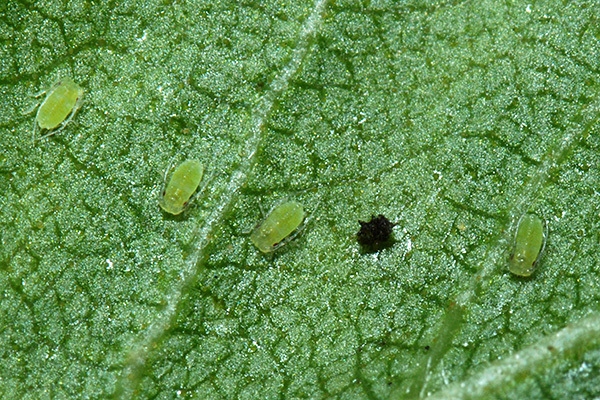 They demonstrated that Monaphis antennata nymphs occupying the upper surfaces of the leaves - the normal feeding position - were less likely to be attacked by coccinellid larvae than those occupying the under surfaces. Whilst this is the case for 'random walk' predators such as coccinellid larvae, the upper surface does not provide a predator-free space when considering predators that search visually for prey - such as birds and vespid wasps - quite the opposite in fact. These presumably provided the selective pressure for development of the excellent crypsis of Monaphis antennata nymphs. So just how rare is Monaphis antennata? Hopkins et al. (1998) notes that in Britain it is 'always' found at low densities on individual hosts and has low local abundance, at least in comparison with another birch-feeding aphid, Euceraphis betulae. However, in Turkey Senol et al. (2014) found Monaphis antennata on a birch tree in the city centre and noted that "all individuals were alatae and heavily colonized the leaves of the tree". Durak & Wojciechowski (2008) found Monaphis antennata subdominant in two types of birch woodland, and more common than several species including Calaphis flava, Callipterinella tuberculata and Hormaphis betulae. In southern England we have found Monaphis antennata less common than Euceraphis species and Symydobius oblongus, but more frequent than several species including Glyphina spp., Callipterinella calliptera and especially Hamamelistes betulinus. Monaphis antennata has been recorded from at least 6 Betula species (Betula maximowicziana, Betula microphylla, Betula papyrifera, Betula pendula, Betula platyphylla, Betula pubescens).